THIS WEEK’S OTHER FEATURED BOOKS, “COURAGE, ENDURANCE, SACRIFICE,” BY CHARLOTTE HARRIS REES AND “HALLOW BE THY NAME,” BY AMY McLEAN, CAN BE FOUND BY SCROLLING DOWN BELOW THIS POST, OR BY CLICKING ON THE AUTHOR’S NAME ON OUR AUTHOR PAGE. THE BOOK: The Beauty Shop. THE PUBLISHER: Avis Press, UK. SUMMARY: England, 1942. After three years of WWII, Britain is showing the scars. Circumstance brings three people together, changing their destinies and those of many more. John ‘Mac’ Mackenzie of the US Air Force is aware of the odds. He has one chance in five of surviving the war. Flying bombing missions through hell and back, he’s fighting more than the Luftwaffe. Fear and conscience stalk him on the ground and in the air. Shy, decent and sensible, Stella Charlton’s future seems clear until war breaks out. As a new recruit to the WAAF, she meets an American pilot on New Year’s Eve. After just one dance, she inconveniently falls in love. But when her handsome airman survives a crash, her battles have just begun. Dr Archibald McIndoe, New Zealand plastic surgeon, is on a mission to rebuild burned and injured fighters – their faces and their minds. Under his care, members of The Guinea Pig Club overcome disfigurement, pain and prejudice to learn to live again. His methods are unusual but so is this scale of warfare. Based on a true story, The Beauty Shop is a moving tale of love, compassion and determination against a backdrop of wartime tragedy. THE BACK STORY: When I first stumbled across the story of the Guinea Pig Club and Archibald McIndoe, I knew I had found something quite remarkable. I spent three years researching, writing and refining the book. It was a long process, and difficult because I was using a real person, the plastic surgeon Archibald McIndoe, and I had to wait for his voice and his persona to develop. There were many re-writes! I loved writing the bombing mission scenes with the Mighty Eighth Air Force, perhaps because they are the most tense. Trying to craft each scene was difficult, especially as I was attempting to gain knowledge of how to fly a B-17 bomber. In addition, I also needed to know how the aircraft was affected mechanically when hit and damaged by cannon fire. All I can say is, thank you, internet! I was drawn to a specific theme – young men eager to go to war, with the knowledge they may well be killed, yet never expecting to be severely injured, disfigured, disabled and survive. The reality was that not all of them coped very well with that. The story is not simply about treating injured servicemen in hospital. It goes far beyond the realms of medical practice, reaching into the depths of humanity and society, the changes in both medical practice and social attitudes. During the WW2 era people shied away from those with disfigurements and disabilities and there was a lot of discrimination. McIndoe set out to change that and his methods truly were quite extraordinary. WHY THIS TITLE? : The title is a red herring. The airmen who were treated by Archibald McIndoe at the hospital in East Grinstead, referred to their ward as “the beauty shop” because it was where they were sent to be “made up” after being badly injured and burned. and romance. If you’ve never heard of the Guinea Pig Club, it will be an enlightening discovery, but what is more fascinating is Archibald McIndoe’s approach to the care he gave – not simply the medical care. REVIEW COMMENTS: “I had never heard about the Guinea Pig Club before reading this incredibly well researched book and was left in awe of the pioneering work of Dr Archibald McIndoe! His holistic approach to the treatment and welfare of his men was clearly ahead of its time.” Jackie Baldwin – Author of Dead Man’s Prayer. 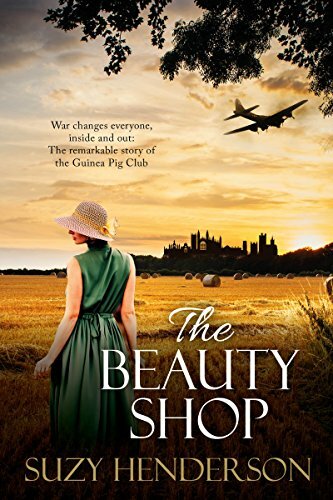 “The Beauty Shop is one of the most emotionally captivating stories I have read in a long while and one that will stay with me for a long time. I adored the characters, the setting, and the story. This one is a keeper. If I could give it more stars, then I would!” I Highly Recommend. Annie Whitehead – Author of To Be A Queen, Alvar the Kingmaker and contributing author to 1066 Turned Upside Down. I left my career as a midwife some years ago and pursued a degree in English Literature and Creative writing. This was the beginning of a new journey as I rekindled my passion for writing while continuing with my love of history, especially military and aviation history. An old black and white photograph of my grandmother captured my imagination some years ago, and while researching her war service I became absorbed in the era and never really left. My gran passed away when I was a child and she never spoke of the war, taking her stories with her when she died which is sad and a loss to those left behind. My digging uncovered many great stories and the more I discovered, the more obsessed I became. Stories came to light, little-known stories, and tragedies, and it is such discoveries that inform my writing today. While my grandmother inspired me to write, I have since become lost in the past, compelled to write stories that illustrate the strengths and the extraordinary accomplishments of the human spirit. I live in North Cumbria, UK, with the Pennines and the hills of the Scottish borders in sight, a rich, beautiful landscape. My next book is also set during WW2 and is scheduled to be released later in 2017. I am also a member of the Historical Novel Society. AUTHOR COMMENTS: The story of the Guinea Pig Club is still not widely known, nor the work of the plastic surgeon, Sir Archibald McIndoe. His pioneering techniques laid the foundations of our modern day plastic surgery. His ethos of care was simply remarkable and so far removed from the stereotypical surgeon of his time. He was an exceptional man who went to extraordinary lengths to ensure the servicemen in his care had full lives after the war, despite their horrific injuries. WHERE ELSE TO BUY IT: Amazon : myBook.to/TheBeautyShop From the end of January 2017 it will be widely available in paperback from Amazon, Barnes & Noble, Waterstones, Foyles and many more outlets. Thank you so much for hosting me here today – it’s so appreciated and thank you for such a great interview. All best wishes. I’ve put this one on my “to read” list. Sounds very interesting.